The 7100 Plus is the latest offering from Wittenborg. It is a large, table top bean to cup coffee machine that looks the part and produces a good quality bean to cup coffee. A full range of speciality coffees are available including cappuccino, latte, espresso, Americano and caf� au lait as well as hot chocolate. A soluble coffee canister allows for decaffeinated drinks to be offered including black and white coffees and cappuccino. Finally there is a hot water button allowing the tea drinker to be catered for. The internals of the 7100 Plus are coloured allowing for easy identification of those parts that need regular cleaning. 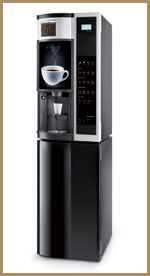 This coffee machine is based on the popular, successful and reliable 7100. This means that N & W Global Vending have been able to make a few tweaks in order to bring the system up to date without compromising the fundamental workings of the machine. As with all bean to cup machines in the South East of England we would always recommend that a good quality water filter is fitted in order to reduce the impact of the hard water found in the region. If a filter is not fitted then there can be long term implications on the reliability of the machine. Kenco Local Business Service can offer the 7100 Plus across London and local towns such as High Wycombe, Aylesbury, Maidenhead and Slough. The 7100 Plus is available on either a purchase or rental basis. Our own team of technicians allow us to offer a comprehensive technical back up across the region including full training when the machine is delivered. If you are looking for a cheaper option then we often have a variety of refurbished bean to cup coffee machines available. These systems are suitable for use in the office, in hotels, pubs and conferencing rooms.